I do believe that probably the only person that will get me title is my good old friend Tara...for the rest of you who probably never heard of the movie...my title comes from a song in the sweet movie Grease 2. Yes they made a second one. Yes it had Michelle Phifer in it. AND yes, there was bowling in it. Let's bring it back. Retro bowling party. Yup it happened, even despite me running a fever days before. All of my party plans didn't quite come to pass, but I still think it was coolsville. My whole party was based on the fabric that I had found. It screamed retro to me. Once I had made Little Man's bowling shirt and bag, the rest of the party followed theme with chocolate brown and orange. 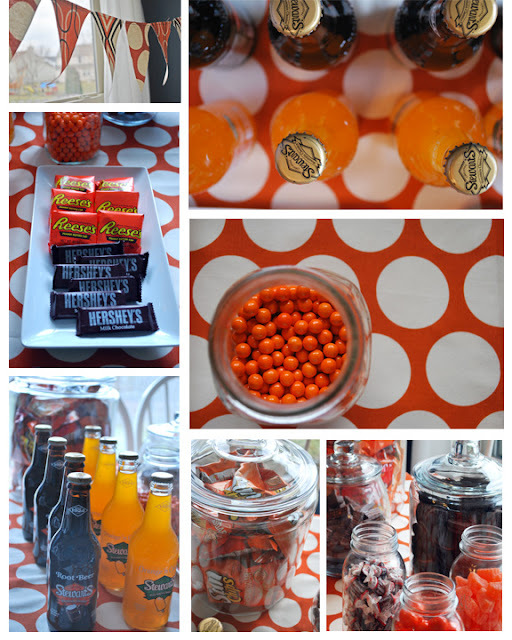 One of the easiest ways to decorate a party is to find food and drink in a color matching the theme. Boy did I find some fun orange and brown food. Of course my brand new Silhouette had to play a part in the decorating. I made these three 16x20 canvases by simply taping off a boarder, painting them with craft paint, and then cutting out the shapes and phrases from vinyl. This might have been my favorite part! I also used the Silhouette to cut out these way cute cupcake wrappers. What would a party be with out a little goodie bag to take home? I made our bowlers a mini version of my bigger bowling bag and packed it full of orange and brown goodies. This party was super fun. I would totally do a party like this again. I think my Little Man would agree. Uh...you are crazy. But in a good way :) Looks great! I see you're breaking in the new silhoutte!! Great ideas!! I don't know if you know this, but I've been on a gumball kick lately. Don't worry, I'm contemplating shelling out $35 for 850 gumballs. I heart you. I heart your ideas and I heart your parties. Oh...and I heart your offspring. Awesome party! Love the details! What a fabulous party! I love it! I featured it on Hoo's got talent! Thanks for linking up to the party! Awesome party! So many cool details!